These days the answer to better cognitive performance seems to involve the concept of “Executive Function”. Many a consultant can assess your child or you for performance in various aspects of executive function skills. They can then provide you with all sorts of support systems to help and generally instill new habits, not necessarily the skills. What are executive function skills? They are commonly considered to be paying attention, organizing, and time management to name a few. The skills typically emerge over time with normal development, and this development has been the subject of much functional brain imaging. Where is clear—how, not so clear. We see time and time again that the secret for brain development is in motor skill development. A recent study conducted by Oregon State University shows an association between executive function development and simple hand-eye manipulative skills. In preschool children, better visual-motor integration skills were significantly related to better executive function scores, suggesting that visual-motor skills help lay the foundation for executive function. The study measured a child’s ability to throw, catch, kick, bounce and hit targets with balls. The manipulative skill assessment included tracing, copying, building with blocks, folding paper given specific instructions, and manipulating pellets into small containers. Building with blocks. Playing with balls. Pretty simple stuff that cannot be experienced on a screen. Did you know by age four a child should be able to catch, bounce, and toss a ball? Playing with balls requires so many little skills wrapped up in one. Bouncing a ball involves postural shifts engaging the vestibular/balance system, shoulder/elbow/wrist/finger coordination, as well as head and eye movement timing coordination. No wonder some of us have a hard time! The relationships necessary for well-integrated visual-motor development begin in the early months of life and can be thrown off by very common events. The saying ‘Life happens’ certainly applies! Birth stress from C-section, breech, multiple, and wrapped umbilical cord. Birth characteristics have a variety of impacts to the movement and structural foundational relationships. The prenatal movement repertoire is often incomplete or the abnormal stress at birth upsets the prenatal movement foundation. NICU or PICU support in the early months of life. The IV’s, mechanical breath support and other early medical interventions inhibit development of arm/shoulder relationships foundational to visual-motor skill evolution. These arm-based procedures are necessary at the time for medical care, but there is a lingering impact to subsequent development. Falling in the first years of life. This literally jams the flow of the hand-eye movement flows. Seventy-three percent of ER visits in age 0-4 children are for falls. Falls, the largest source of concussions in children, are commonly from car seats, shopping carts, strollers, high chairs, stairs, beds, etc. Broken forearm, hands, fingers, and clavicles. Together these account for over half of all childhood fractures. The injury and immobilization (cast) each have an impact to visual-motor skill function by blocking the flow in the segmental coordination for fluent motor skills. At what ages can we identify gaps? Beginning at birth, there are distinct phases of motor control and visual integration. At six weeks of age we are able to tell when this visual-motor foundation is working easily, or needs a little help. Infant-Toddler aged children’s skills can be identified by play and exploration. Preschool children should be writing shapes and mastering a variety of hand grasps, as well as having tons of fun with balls and blocks. Adults and Older Adults also can have challenges with visual motor skills which have nothing to do with getting older. They have everything to do with injuries, illnesses and medical interventions. Passive core organizing movements of rocking and stretching. Balance tests when vision seems to be related to vestibular/balance concerns or when a Traumatic Brain Injury (TBI) is part of your history. Where does Bridging® come into play with visual-motor skills? There are two parts to problem solving visual motor skill glitches. The first task is not merely determining the skills are troubled. We go the next step to determine how they do work together. The second aspect is to determine which aspects of developmental foundation preceded the skill gap. Before addressing the gap we need to rebuild the foundation. Sometimes the gap clears itself once the substrate supports the skills. Identify how skills actually function, which also provides insight to what is challenging on a daily basis. Visual-motor skills are generally present, but often function in unstable and inefficient ways. Instead of a yes/no evaluation, we consider the ‘how’. Identification of precursor gaps in the most basic aspects of integrated function related to stages of infant development. For example, we identify glitches in the establishment of a stable midline, ability to cross midline, differentiated hand use. We also check the underlying postural movement and control of the head/neck/core supporting visual movement. Restore the stability of body, arm and head function making it easier for vision to work with the body. Restore the ranges of postures and movements which are required for daily visual-motor tasks. Reaching up for a ball, or reaching down to tie shoes requires different skills and relationships between the body, hands and eyes. What we don’t do? We leave the thorough evaluation of visual skills up to the many excellent Developmental Optometrists. They also have a very structured therapy program to refine and reinforce the visual skills with the motor skills we enable. What do we do to correct the gaps? In a nutshell—we use Bridging to rebuild the relationships between the body, hands and eyes in the same order they should have originally developed. We stabilize the body and head in series of sequential progressive postures which follow development—laying down, seated, and standing. We make sure specific transitions are working well. Again these relate to the sequence of development. Amazingly the observation and feedback consistently indicate that emotional, cognitive and executive function gaps begin to fill in. All ages are able to concentrate more easily, complete tasks with less effort, and take on more complex challenges. Most of all they seem to have more fun and are playful! We often sit back and check the list of developmental play and transitions at the end of a session. Once the structural relationships are enabled, the development of visual-motor skills unfolds right before our eyes. It is truly amazing to watch. Want to see how well your child’s visual-motor basics work? Consult the Kinetic Konnections’ team, or your Bridging technique professional. Fist bump? Shake hands? Big hugs? Hang-loose wave? Families have greetings. Fraternities have handshakes. Teams have hand signals. These are all versions of gestures– a powerful way to quickly communicate so much meaning in a short interaction. There are big gestures used to direct traffic and airplanes. There are little secretive gestures used to convey affections. There are colorful gestures to convey emotion and frustration. Gestures are all around us! But what if your motor skills don’t allow you to gesture accurately or easily? Turns out your communication skills don’t quite match the others’ perceptions either. Have you ever been misinterpreted due to body language? Offered a too weak or too strong handshake? Friends wonder why you’re so reserved? Classmates wonder why you’re so over-excited, crazy all the time? A parent is sad because their child won’t hug them? We find that there is sometimes an overlooked aspect to these frustrations—the motor skills just don’t work. The inside emotions and thoughts don’t match the external body language and gestures because the movements haven’t developed yet. When do gestures develop? The foundation for development of gestures happens in several phases of infancy. On Back: Eye-Head-Body coordination developed on the back playing with caregivers and toys. Baby Toes: Playing with baby toes! Not only is this a silly fun phase, it serves to link the various body parts with the focus of the visual system. Lots of brain development going on! Pointing: In the world of social communication, pointing is the first milestone in purposeful social interaction. This often develops in months 10-12. Why would these skills not develop? We find a myriad of reasons for the skills to be skipped. Tummy time Discomfort: Babies born via C-section or spending time in NICU often do not like to be on their tummies. Arm integration interrupted: Often babies born via C-section are pulled out by an arm. This disassociates the wonderfully woven motor skills at the shoulder creating a roadblock to symmetric development. Head Integration interrupted: Born via C-section, torticollis, breathing support at birth, forceps/vacuum birth and wrapped umbilical cord are all stressors to complete vision-head-body development. Boo-Boo’s: Nearly every curious child gets themselves into a situation that puts their head or upper body at risk of a bump. Some bumps are just enough to disrupt well-developing visual-head-arm-core function. Infant/Childhood Medical Procedures or Surgery: The process of surgery—anesthesia, breathing support, IV’s, etc. are just enough for just long enough to throw finely tuned visual-motor development off. But those were years ago! Even though these traumas may have happened years ago, the body is still affected. The body is amazing and seems to figure out work-arounds making the underlying gap hard to observe without specific assessment. We find all ages can have stress or dysfunction in the ease of gestures and it often tracks back to this early period of life. The body’s compensatory strategies allow you to move forward, but not at peak performance. Here’s how the subpar performance impacts function by age. Young children: Gestures inhibit communication and language development. Teens: Visual-motor limitations affect participation in recreational activities and impact social skills. Adults: Visual stress, social engagement challenges with their children, pain in hands/shoulder/neck. Older Adults: Impacts self-care skills, communication and can relate to balance concerns. Next up One way we help our clients get back on track and eliminate challenges is to restore foundational movement transitions supporting gesturing. In my next post, we’ll look at how we assess and identify the root cause of the gesture challenges. Step into a new view of your professional world where so much more is possible. Step into a new level of understanding of the links between development, physical regulation, learning, emotional regulation, behavior and pain perceptions. The physics relationships in a person’s body related to movement and regulation of temperature, volume and flows necessary for survival are at the heart of the Kinetic Bridging technique. We use movement to restore these elementary relationships that normally develop early on in life to get people back on track physically and developmentally. By learning the Physics principles we are all based upon, you will transform your thinking about how to help people facing physical, mental, and even emotional challenges to move forward and thrive. Improving the most basic movement relationships in the body supports unimaginable changes in all aspects of how we function. 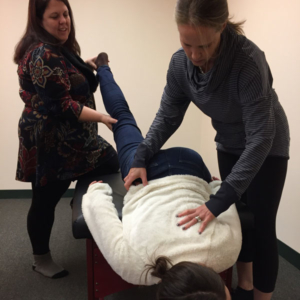 Whether you want to learn a new tool to help your patients or better understand a technique that could relieve frustration for yourself or a loved one, we have a level of learning for you.